The Old Weir Bridge is one of Killarney’s oldest structures and it has seen thousands of visitors pass over and under its famous arches for centuries. Despite its fame, not everyone is lucky enough to make it to the bridge. Make sure to take a little detour so that you can experience the magical setting of the Old Weir Bridge in Killarney National Park. Describing the location of the Old Weir Bridge as “off the beaten track” may be stretching it a little, considering it has been a tourist attraction for hundreds of years. 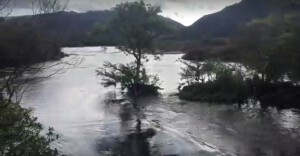 Despite this, the fact that there is no direct vehicular access to the location of the bridge, means that it is not always a place that is on the ‘must see’ list of visitors to Killarney. This is a shame. Although it does require some additional effort to get to the Old Weir Bridge, the effort is rewarded in spades as it is a truly special location in the heart of Killarney National Park. 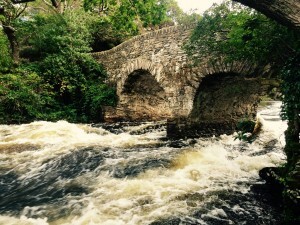 The Old Weir Bridge and its close neighbours at Dinis Cottage and The Meeting of the Waters are situated in between some of the mega attractions of Killarney National Park, namely Muckross House & Gardens and Torc Waterfall & Mountain. These two areas attract a huge percentage of visitors to Killarney and rightly so. While visiting these areas, it is well worth your while making the additional effort to make it to the Old Weir Bridge. The exact age of the Old Weir Bridge is not clear but it is believed to date from the 16th century. It predates by many hundreds of years the beginning of the popular boat trips through the Lakes of Killarney. Long before tourists passed beneath its arches on a day out on the lakes, the bridge was used to cross over the fast flowing waters and currents at this point. Perhaps it was used to transport timber from the nearby oak forests of Tomies woods. 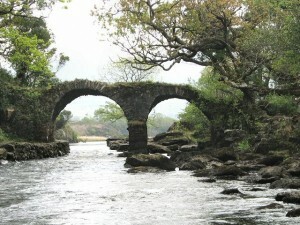 The early use of the bridge may not be clear but its unique location at the Meeting of The Waters of Killarney’s three lakes has ensured that it has remained a popular destination for hundreds of years. The visit of Queen Victoria in 1861 put Killarney on the map as a tourist destination and it has never looked back since. Central to the Queen’s visit was an extensive tour of the lakes by boat. A boat trip in Killarney is still one of the best visitor experiences to be had. Top of the list of boat trips is the famous Killarney Day tour or ‘Gap of Dunloe’ trip. This all day tour travels through the Gap of Dunloe and the Black Valley and returns to Ross Castle in Killarney via boat through Killarney’s three lakes. Central to this magical trip is a stop off at the Meeting of the Waters and the Old Weir Bridge. Thousands of visitors to Killarney have disembarked at the Old Weir Bridge or at the nearby Dinis Cottage. The area is a natural stopping point to take a break on the journey through the three lakes. The tea rooms at Dinis Cottage have served refreshments to thousands over the years. There are a number of ways to get to the Old Weir Bridge – by boat, by walking on a bicycle or a combination of some of these. The nearest car parking spot on the main N71 Killarney to Kenmare road is a distance of about 1.5km away. From here, it is about a 20-25 minute walk to the Old Weir Bridge. The main car park at Muckross House & Gardens is approximately 5km via the Muckross and Dinis trail that skirts around Muckross Lake. 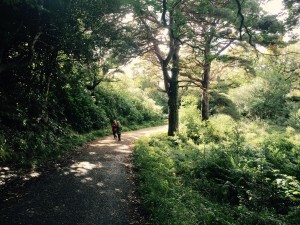 The rolling paved paths are closed to motor vehicles so it makes for a lovely cycle (one way) or walk around the Muckross Peninsula. There are numerous places to stop off along the way including a secret hideaway at Rosie’s Beach. Dinis Cottage is the landmark closest to the Old Weir Bridge if you are approaching from dry land. The Cottage houses tea rooms in the summer months and there are toilet facilities here also. From the Cottage, the Old Weir Bridge is only a few hundred metres via a trail that meanders through the woods and streams that surround the cottage. The start of the trail is marked by a grey sign a few hundred metres east of Dinis Cottage (on the path from the N71 car park). Beware that the start of the trail can often be flooded during the winter or after some heavy rain when the lake is high. With some adventurous spirit and a bit of off-trail navigating, you should be able to avoid the water and find the trail to make your way to the bridge. There are some boardwalks placed on the trail to help you make your way through some of the more uneven and damp ground. Take care here, it can be a bit slippery when wet. This is a short and easy path so it is worth the effort to find it if the start of the trail is flooded. In a few minutes, the path drops slightly as reach the bridge. For those travelling via boat, you may have to disembark just before the Old Weir Bridge to safely make it through from one lake to the other. As the name suggests, the bridge crosses fast flowing water near an eddy I’ve heard described as O’Sullivan’s punch bowl. When the water is high, this can be a dangerous channel and requires an experienced boatman to navigate through safely. Here’s what it looks like after some heavy rain! The end of the Long Range river coming from the Upper Lake is on your left hand side. The Meeting of the Waters and Dinis Cottage is off to the right. The other end of the bridge has a railed pedestrian gate. We can speculate that a toll may have been charged to those crossing the bridge in days gone by. Thankfully there is no charge today and the only money you will need is if you fancy a coffee at the Cottage afterwards. The bridge has been recently restored so that the walls are now fully intact. For many years the bridge was in disrepair and the walls had crumbled away to ankle level. Passing through the gate brings you down to the point where you can safely rejoin your boat. The water is much calmer beyond the Old Weir bridge and from here you will glide on towards Dinis Cottage. Also on this side of the bridge is one of the geocaching locations that exist around Killarney National Park. It is a cliché yes but clichés are there for a reason. There is no bad time to go and see the Old Weir Bridge. In any weather at any time of the year, there is a something special about the place and the nearby Meeting of the Waters. In summer time, the Meeting of the Waters is a magical retreat nestled between the bridge and Dinis Cottage. It is a beautiful place to wander into the woods to have a picnic and watch the boats head under the bridge and on to the next lake. In less fair weather, when the lake water is high after heavy rains, the channel can be a spectacular sight. NOTE: In winter and after heavy rain, the path from the car park on the N71 to Dinis Cottage can be flooded so it may not be possible to access the Old Weir Bridge on foot. The Old Weir Bridge is a special place in many ways. It is situated near to where the three lakes of Killarney meet and diverge. It is a tranquil place yet it can be wild and spectacular after heavy rains when the lake is high. Despite its long history and tradition of visitors, it still retains a sense of remoteness. So come off the beaten track for a while and spend some time at the Old Weir Bridge. It will be time well spent for sure.